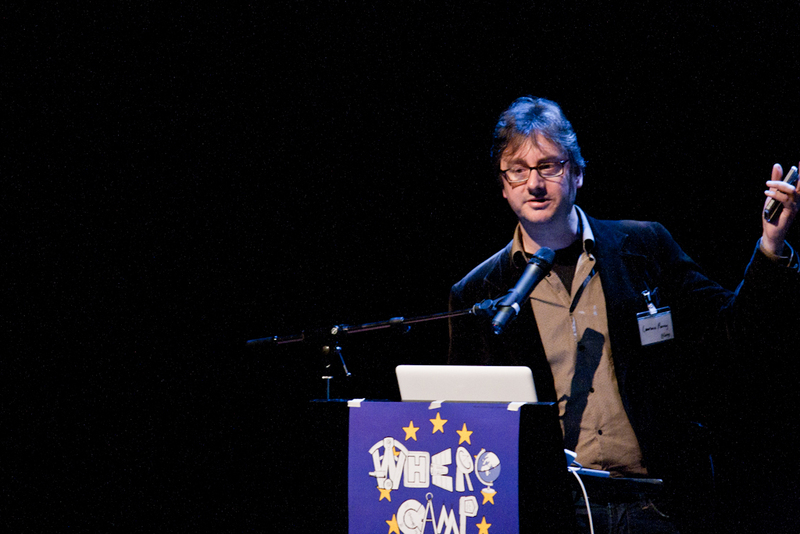 UPDATED: added the names of two speakers: Hugues Bouchard and Diego Arechaga. 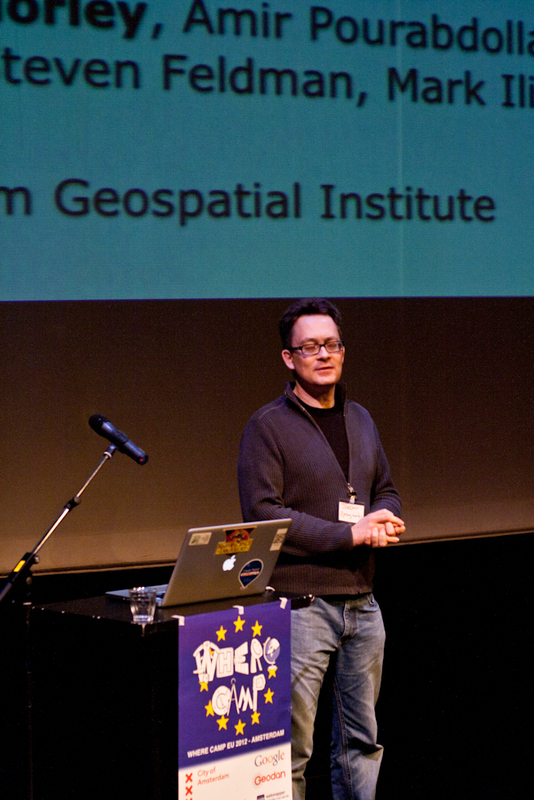 We learn from Ed Parsons, Google’s Geo man, that Google Maps and OSM are not fierce enemies. Au contraire, “Google wants OpenStreetMap to succeed“. 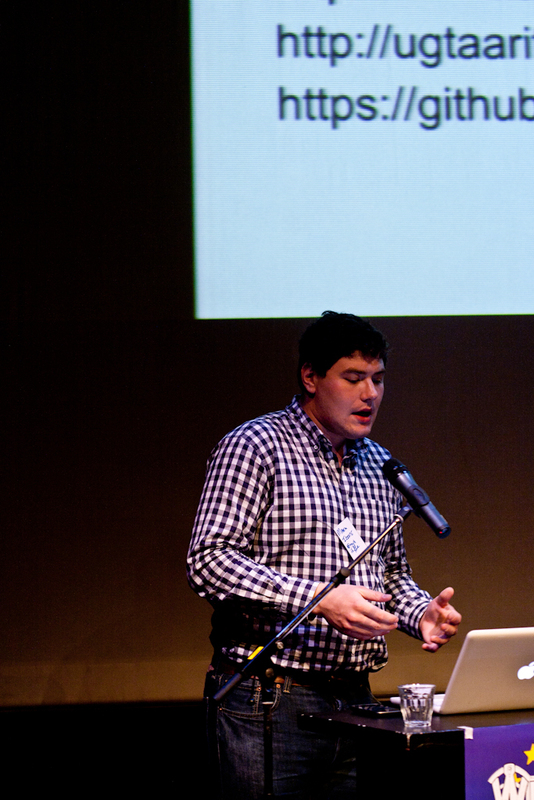 So I took a picture of Ed presenting OSM, announcing it cheekily as “Ed’s defection to OSM” (no, that’s not true). All of this might have earned him the title of Saint Parsons (thanks, Henk Hoff). I agree on one thing: Google Maps and OSM are not competitors. OSM is a database providing geographical data. You can use it to create a cartographic rendering, but it’s not its main goal. People seem to forget it. Yahoo’s Adam Rae showed how you can use Scale Spaces theory to infer regions in a map from the geographical distribution of tags. Although Adam’s results are great in their own right, and the mere ability of detecting boundaries via tags is a fascinating possibility, I find this extremely interesting also for its implicit dynamism: tags about a location can change. Ethnographers who wish to learn how the perception of what is a place, how a place changes, or how the boundaries of a location are fluid, might use this technique. This is true in space and time. An interesting, although intended to be funny, example of such perception shift is http://thisisntfuckingdalston.co.uk showing that the boundaries of a place change according to a spatial component. Moreover, a temporal component might be added to the model, assessing how people’s perception of a given place changes over time. Take, for example, an expanding neighbour. 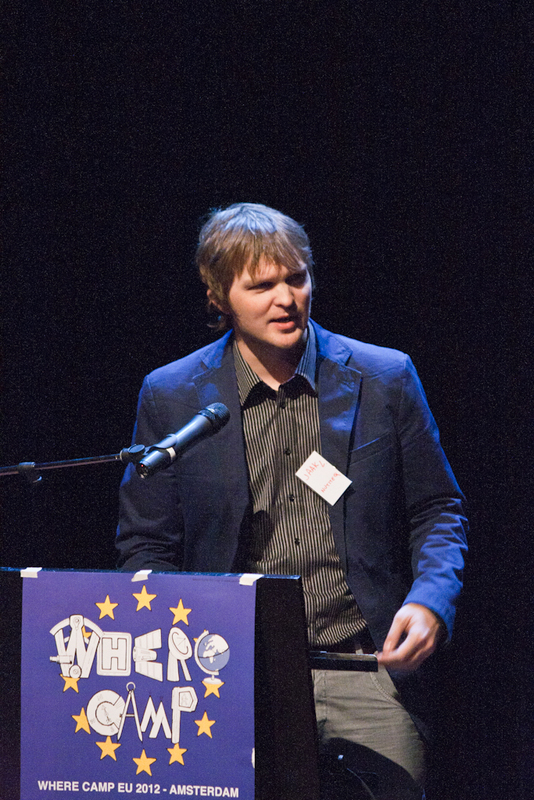 Jan Nowak, an engineer at Nokia, showed how Nokia Maps API can be used to go “from data to meaning in 20 minutes“. Someone complained that “Nokia doesn’t do anything that Google hasn’t already done“. I don’t think this holds true: first of all, there are some genuinely innovative UI elements in Nokia Maps (see WebGL). But more importantly, they are adding a great element of competition to already existing services. Even if Nokia Maps were just yet another map service, with comparable features to Google’s, that would be beneficial to developers and to the geo community at large. It’s a challenge that will bring innovation. Why complain? Jeremy Morley from the University of Notthingham gave the attendees the last updates about the OSM-GB project, whose aim is to measure and improve the quality of OpenStreetMap in Great Britain. This is a very interesting project with very useful outcomes both in the academic and applicative areas. The project aims to answer questions such as how authoritative a crowd-sourced map can be, and to show how multiple sources, including crowd-sourced maps, can be used together to improve the overall quality of the geographical information. One very important aspect of this project is exactly its contribution to OSM happening at the same time as offering a model for updates to non-crowdsourced mapping efforts. Having contributed to the project and to the presentation, I’m very happy with the reception that Taarifa has received, mostly thanks to a great presentation by Mark Iliffe, a PhD student at the University of Nottingham. His public engagement skills are well known and they earned Taarifa promises of contribution by many of the people attending. There was also a mini hack-session with over 10 people willing to discuss Taarifa and envision ways to improve it and put it to good use. Day two opened with Jan Van Eck telling the audience why Esri is interested in Where Camp and how they think they can contribute to the geo-computing community. He showed some of Esri’s work in the area of maps production and user experience, with the goal of making a case in support of their philosophy, not always in tune with that of OpenStreetMap. However, it must be said that Esri’s contribution to the perception in the public of the existence of a “geographical issue” is certainly a big one. Another interesting piece of work by Yahoo, led by Vanessa Murdock with contributions by Hugues Bouchard and Diego Arechaga (pictured below), showed how hash tags can be used to infer hyperlocal trends, similarly to what Adam presented earlier on. Goldsmith’s design student Francisco Dans led a very practical session about real-time data crunching with map displaying as a result, with tricks and tips on how to use Processing to parse xml/kml. He showed how he used this framework to display trams in San Francisco on a map in real time. Francisco advises using UnfoldingMaps as a tool to create interactive thematic maps and live geovisualizations. 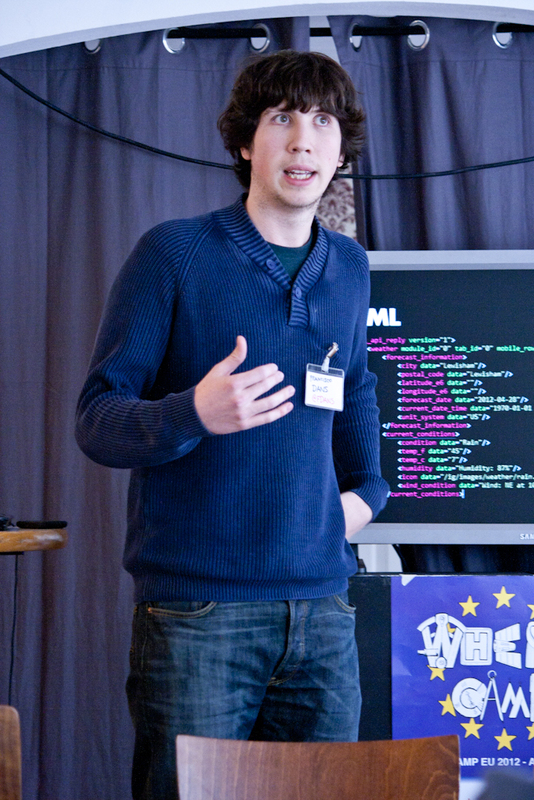 Ollie O’Brien is a well known attendee of WhereCamps and Geomobs, working as a Research Associate at CASA. 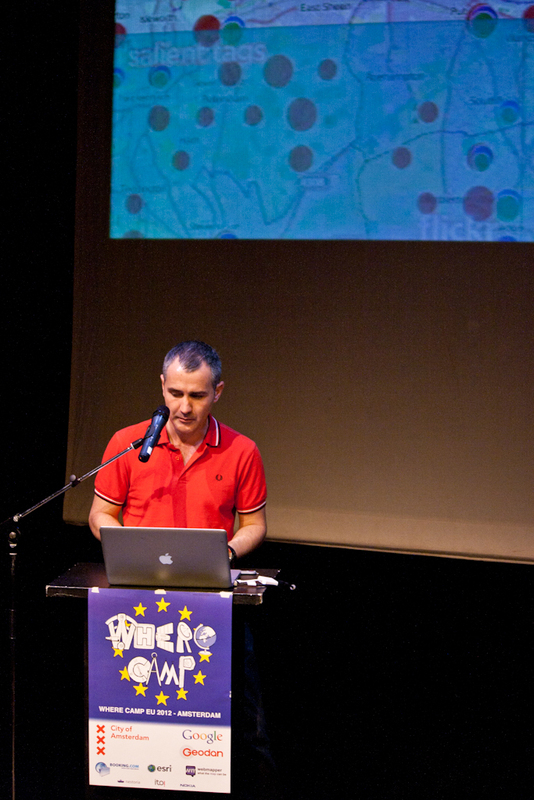 He introduced his recent work on creating City Dashboards: web aggregators of several data sources about a single city. These are extremely useful central points of information for citizens and tourists. Ollie also showed a fun and mind boggling piece of software, developed at CASA, that allows users to fly the sky as they were pigeons. Using a Microsoft Kinect controller and Google Earth, the user can “play” with the system by flying among building using gestures. Laurence Penney is always aggregating the more “cartographicals” of us at his enlightening talks. This time, he came up with a very insightful talk about unidimensional (or linear) maps. A good example of such maps is the Trajan’s Column in Rome, which tells a story in time and space on a single dimension. Of course, a similar technique can be used to represent geographical information. In the past such maps have been used by seamen as “rolling maps“, in a way not too dissimilar to what current GPS navigators do, by displaying what your next step is. What was very interesting in Laurence’s talk is how he conveyed the high aesthetical value of these maps. There were many other open discussions, including Nutiteq‘s Jaak Laineste showing their latest SDK, useful to create and navigate 3D maps, and ITO World‘s Peter Miller showing how ITO uses and contributes to OSM by adding layers of data. Philip Kandall of Skobbler introduced some advanced routing features (“routing from A to B is boring“) that will be in future navigators, including route calculation by time available for the journey (i.e. not as a maximum time, but as a minimum). As traditional for WhereCamps, a couple of light-hearted moments have closed the unconference: Tim Waters‘ geo-yoga, involving stretching positions that mimic country shapes (I guess we can work on a KML representation of such positions?) and Mark Iliffe’s Geo-Locating Geobeers, suggesting how the Taarifa Platform can be used to report beer drinking location and level of… happiness. 2) Gary Gale (@vicchi) and his session on mapping as a democratic tool can be reduced to a motto: We left OS times, we are in OSM times. Starting from the consideration we don’t talk about addresses but about places, part of the talk was dedicated to the effort Gary and others are putting into defining a POI standard. The idea is to let the likes of Foursquare, Gowalla, Facebook Places, etc…, store their places in a format that makes importing and exporting easy. Nice for neogeographers like us, but does the market really want it? Some big players are part of the POI WG, some are not. 3) I really enjoyed the sessions on mobile games, especially the treasure hunt run by Skobbler. However, some of these companies seem to suffer from the “yet another Starbucks voucher” syndrome. I’m sure that vouchers and check-ins can be part of a business plan, but when asked how they intend to monetize their effort some of these companies reply with a standard “we have some ideas, we are holding some meetings“. Another issue that needs to be addressed carefully – and that seems to be a hard one – is how to ensure that location is reported accurately and honestly. It doesn’t take Al Capone to understand you can easily cheat on your location and that when money are involved things can get weird. 4) It was lovely to see Nokia and Google on the same stage. Will it translate in some cooperation, especially with respect to point 2)? 6) Mark run a brainstorming session about his PhD topic: how to evaluate trust in citizen reported human crisis reports. This is a very interesting topic, and he reports about it extensively on his blog. However, I’m not sure this question can have a single answer. What I feel is that different situations might require different models of trust evaluation, to the point that each incident could be so peculiar that even creating categories of crisis would result impossible. Mark’s statistical stance on starting his work might return an interesting analysis. I’m looking forward to see how things develop. 8) Can’t help but praise Chris Osborne for his big data visualisation exposing mcknut‘s personal life :-) And also for being the best supplier of quotes of the day and a great organiser of this event, as much as Gary. 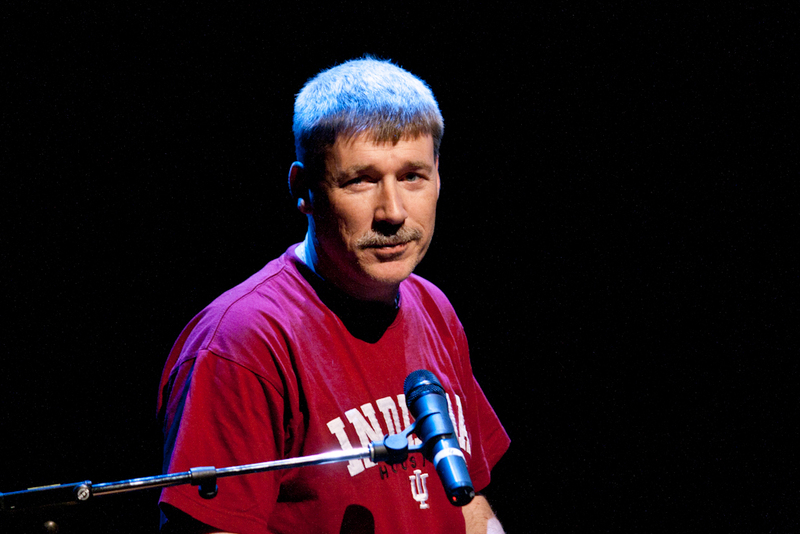 1 – live code presentations are doomed, as Gary suggested. They need better preparation and testing. 2 – no talk should start with “I’ve just put these things together”. Despite this being an unconference, that shouldn’t mean you want to show something bad quality. Or anyway give that impression. 3 – a hacking/hands on/workshop session, on the model of those run at #dev8d. A good level of participation for yesterday night GeoMob. Despite two speakers’ defections we had a well balanced schedule (one big company, one researcher, one startup) and a rich Q&A session. Here’s my usual summary with some thoughts embedded. There was some good debating about updating StreetSlide imagery, thanks to a question by Ollie. This is a well known problem in Google StreetView, especially in busy London High Streets where shops sometimes change hands multiple times in a year. As a result, by the time StreetView imagery has reached Google’s servers it displays a vintage version of reality. Vikas claims that by partnering with Navteq they will be able to update images every 4-6 months. Vikas earns the best quote of the night award: “I can’t say much about Nokia except that it’s good for us”. I was absolutely fascinated by James’ work upon discovering it on the National Geographic Magazine some months ago. The general subject of this talk is showing how surname origins and popularity can be displayed on a map. Two works were presented about surnames in the US and in London. The talk and the Q&A session highlighted both the power of a map to show surnames but also its limitations. There are obvious problems of visualization: short and long surnames being displayed in different size, choice of colours, positioning, density, granularity. Although the map itself is a beautiful item, I think that its dynamic version, able to show the nth most popular surname, is more useful, but only if used… dynamically. What I mean is that in places that are true melting pots like London what it’s interesting is not what surname or surnames are the most popular, but rather what’s the distribution of names of a certain origin in a given place. In other words, given the assumption that certain surnames can be related to certain communities, it’s interesting to see that the first five most popular in a given area are sometimes from five different origins. James was open about the issues of visualising surnames this way, especially about how to treat granularity (e.g. the Irish community in New York is not as big as it would be). There is lot of work to do in this area and a map is only the tip of the iceberg of research, development, coding, and imagination. Impressive UI analysis for this young start-up whose goal is to let people have fun creating and sharing events. Jan, their CEO, delivered a very interesting talk about how UI can lead to a great mobile application. Their strategy of “mobile first, then web” is interestingly different by that of many other startups around. Event creation and sharing seems to have a mind-boggling peculiarity: initially, events will need to be created in the place where they will be held and shared immediately. No forward planning allowed, which sounds strange but might capture the fantasy of party goers. They plan to extend the service to let event organisers create entries. The (long) Q&A session seemed critical but was truly interested. First of all, turning myself into the bad guy, I asked what makes them different from their competitors. I’ve attended GeoMob since 2009 and this is at least the third company introducing a similar service, and their unique selling point is not extremely clear. Surely, UI seems to be really good for their app, but is that enough to get to that critical mass of users needed to succeed? Secondly, the business model seemed not very well defined. Although as any stealth startup Eeve wouldn’t probably disclose too much about it, the general perception was that they need to think about it a bit more accurately, and Jan admitted that. However, I also have the general impression that small companies presenting at GeoMob (not just Eeve) tend to come just with their shiny iPhone application rather than with the backstage work which might be of great interest. This also gives the wrong impression that most of them are trying to monetise upon nothing more than a mobile app. As it turns out, one of the other LBS introducing at GeoMob a similar event-based app was also selling a CRM system to event organisers which is where their main revenue stream comes from. None of this was mentioned at the presentation and we were left wondering with the same questions. I won’t mention all the discussions about stalking and privacy: we’ve done that for all companies providing LBS, so nothing new from that perspective. But it’s always good to have our @StevenFeldman pointing that problem out. To be honest, I’m curious about Eeve and will probably try it out (paying attention to privacy, of course :P). It would be nice to have a report on how many users join the system and especially their B2B strategy. Maybe for a next GeoMob? GeoMob has returned after a longer-than-usual hiatus due to other – and definitely very interesting – commitments of our previous Mr GeoMob, Christopher Osborne. It was a very interesting night with the usual format of four presentations covering aspects of research, development and business. Here’s my summary and comments. I’m a bit unsure on how to comment the involvement of TweetDeck into the GeoSocial business. Max’s presentation has been focused on the integration of their application with FourSquare. It’s a tightly coupled integration allowing users to follow their Twitter friends using the locative power of Foursquare, i.e. putting them on a map. Max gave out some bread for our brains when commenting that “Google Latitude is not good for us because it gives out location continuously, whereas we are looking for discrete placement of users on POIs“: this is a real example of why more-is-not-necessarily-better and, in my opinion, the main reason for which, to date, Latitude has been less successful in catalysing users’ attention on locative services. However, I’m not totally sure why TweetDeck foresees its future into becoming a platform to integrate Twitter and FourSquare into a single framework. “Other apps put FourSquare functions in a separate window and this is distasteful“. Is it really? And how exactly will TweetDeck benefit, financially but not only, from this integration? “We spent a lot of time on FourSquare integration but unfortunately it’s not much used“. They should ask themselves why. Their TODO list includes Geofencing which might be interesting so let’s wait and see. For those of you who don’t know it yet: Chromaroma is a locative game based on your Oyster card touch-ins and touch-outs. They’re still in closed alpha, but the (not so many?) lucky users (I’ve asked to join the alpha 3-4 times, but they never replied) can connect their Oyster account to the game and take part to some kind of Gowalla for transport, based on the number of journeys, station visited, personal and team targets. – open data and privacy: upon joining the service, the user account page is scraped for their journeys. Matthew explained they approached TfL to ask for APIs/free access to the journeys data but “due to budget cuts we’re low priority“. Apparently they’ve been allowed to keep on doing scraping. The obvious issue is a matter of trust: why should someone give their oyster account access to a company that, technically, hasn’t signed any agreement with TfL? This is worrying, as to get journey history data you need to activate Auto Top-up. So you’re basically allowing a third party to access an account connected to automatic payments from your payment card. Secondly, I can’t understand TfL’s strategy on open data here: if they are not worried about the use Mudlark is doing of such data, why not providing developers with an API to query the very same data? Users’ consent can be embedded in the API, so I’m a bit worried that Chromaroma is actually exposing the lack of strategy by TfL, rather than their availability to work together with developers. I hope I’m wrong. Oliver has recently had his 15 minutes of glory thanks to some amazing live map visualisation of London Barclays Cycle Hire availability. He went further to develop visualisation pages for different bicycle hire schemes all around the world – before he received a Cease&Desist request by one of the companies involved. 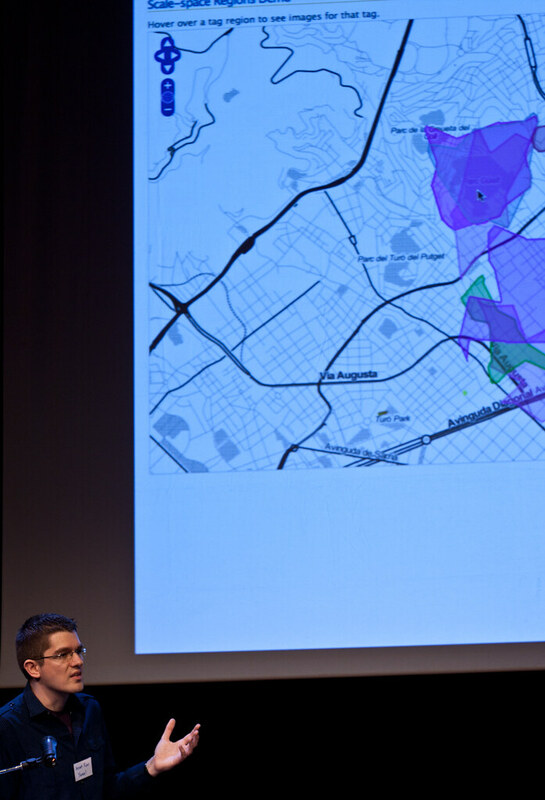 As a researcher, he provided interesting insight to the GeoMob showing some geo-demographic analysis. For example, weekdays vs weekend usage patterns are different according to the area of the world involved. London is very weekdays-centric, showing that the bicycles are mainly used by commuters. I wonder if this analysis can provide also commercial insight as much as Chromaroma’s intended use of Oyster data. Thumbs up for the itoworld-esque animation visualizing bike usage in the last 48 hours – stressing that properly done geo-infographic can be extremely useful for problem analysis. Oliver’s future work seems targeted at this, and ideally we’ll hear more about travel patterns and how they affect the usability of bicycle hire schemes. I can’t really understand why he was asked to take some of the maps down. The main lesson of this presentation: stalk your iPhone app users, find them on the web, question them and make them change the negative reviews. An aggressive strategy that can probably work – and I would actually describe Parkopedia’s strategy as positively aggressive. They managed to get a deal with AA about branding their parking-space-finding-app in exchange for a share of profit. Eugene’s presentation was more about business management than development. Nonetheless it was incredibly full of insight. Especially on how to be successful when marketing an iPhone application. “Working with known brands gives you credibility, and it opens doors“. The main door that this opened was actually Apple’s interest in featuring their app on the AppStore, leading to an almost immediate 30-fold increase in sales. This leads to further credibility and good sales: “Being featured gets you some momentum you never lose“. This is a good lesson for all our aspiring geo-developers. I must say – without making it too emotional – that I feel somewhat attached to geo-events at the BCS as my first contact with the London geo-crowd was there over a year ago, with a GeoMob including a talk by the same Gary Gale who gave a talk last night. That was, at least for him, one company and one whole continent ago – for the rest of us the “agos” include new or matured geo-technologies: Foursquare, Gowalla, Latitude, Facebook and Twitter places, plus our very own London based Rummble, and minus some near-casualties (FireEagle). – big players are not always winners: it’s all just a little bit of history repeating, isn’it? Remember the software revolution? The giant IBM didn’t understand it, and a small and agile company called Microsoft became the de-facto monopolist. OS/2 is still remembered as one of the epic fails in software. Remember the Internet revolution? The giant Microsoft had its very own epic fail called Microsoft Network. It took them ages to create a search engine, and in the meantime an agile and young company with a Big G became the search giant. Some years later, the aforementioned Orkut, started by Google as a side project, didn’t have the agility and the motivation to resist to Facebook. The same might happen about location services. The problem with big players is that they take the quality of data bases for granted. Foursquare et al. found a way to motivate users to keep the POI database constantly updated by using a form of psychological reward. Something that Google hasn’t quite done. Ok, we can motivate users by assigning mayorship and medals. Having a frequently refreshed database is a step ahead. But how do you make money out of it? “Let’s get in touch with the companies and ask for a share of the profit” can work for some brave early adopters. But it will not take long for companies to realize they can use the data – for free – to make business analysis without even contacting foursquare. “Become mayor and get a 10% discount”. What other data analysis should motivate them to pay for it? Knowing where a customer goes next? Where they’ve been before? Maybe to get higher profile in the searches, like in google searches? In the ocean of possibilities, the certainty is that there isn’t yet an idea that works well. “Even Facebook lacks the time to contact the big players to negotiate discounts“. And if you think about the small players it’s even more difficult (but if Monmouth offers me a free espresso I’ll work hard to become their Mayor!). The way many companies are trying to sell it is still pretty much old economy: sell the check-ins database to a big marketing company, blablabla. Cfr. next point. Ok, we have motivated the users to keep our POIs fresh. But they want to be mayor, so they exploit APIs. Their favourite bar has already a Mayor? They create another instance of the same place. They create their own home. I’ve seen a “my bed”. Is there an algorithmic way to filter out the meaningless data? Surely not in the general case. Moreover, as Gary stressed, simply “selling your database starts eroding its value“. Because the buyer needs to find a use for that mountain of data. As for now, such use is not evident, because most of the data is not meaningful at all. Some time ago I noticed a strange absence of overlap among the geo-crowd and the AR-crowd. The latter presents ideas that have been discussed for years by the former as a “revolution”. One problem is that maybe we have augmented reality but not a realistic augmentation, mostly because of reduced processing power on mobile devices. Ideally you would like to walk down the broadway, see a SuperMario-like green mushroom that gives you an extra shot of espresso (to me it’s like getting an extra-life), catch it, and claim the coffee in the shop around the corner. Unfortunately, GPS is not accurate enough (Galileo might solve this problem soon) and walking down all the time pointing your phone camera to the road will only drain your battery (and probably get you killed before you manage to catch the mushroom). It’s not just an issue of processing power and battery life, though. Even with that, there’s a serious user interaction issue. AR glasses might, partially, solve that, but I can’t really believe that augmenting reality is *just* that and not something that empowers a user’s imagination. Geo-AR is on the boundary between novelty (“oh look, it correctly puts a label on St Paul’s cathedral!“) and utility. And currently on the wrong side of it. “I’m sure we’ll make it to the director’s cut” – Alex Housley complained in the typical flamboyant way of the Rummble crowd about being left out of the presentation. “We believe trust networks are the future“. Yes and no. I agree with Alex in the sense that how to provide appropriate recommendations is an interesting research problem (but also here) and the key to monetization of any service. It’s technically not the future, though: Amazon has been using recommendations for years, and I’ve done purchases myself prompted by their recommendations. Trust networks have been extensively used in services like Netflix. What Rummble is trying to do is a more direct way of exploiting trust networks to enrich recommendations, bringing them to the heart of the application. I’m sure that recommendations will play a role in monetizing the geo-thing and that even trust networks may, too. What I’m not sure about is if recommendations will be as they’re now. Without a revolution in the way users perceive local recommendation – that is, a user interaction revolution – they’re not gonna make it. Users need a seamless way of specifying the trust network, and a similarly seamless way of receiving the recommendation. Some random thoughts after The possibilities of real-time data event at the City Hall. I was not surprised to hear the typical objection (or rant, if you don’t mind) of institutions’ representative when requested to release data: “We must comply with the Data Protection Act!“. Although this is technically true, I’d like to remind these bureaucrats that in the UK being portraited by a photographer in a public place is legal. In other words, if I’m in Piccadilly Circus and someone wants to take a portrait of me, and possibly use it for profit, he is legally allowed to do so without my authorization. Hence, if we’re talking about releasing Oyster data, I can’t really see bigger problems than those related to photographs: where Oyster data makes it public where you are and, possibly, when, a photograph might give insight to where you are and what you are doing. I think that where+what is intrinsically more dangerous (and misleading, in most cases) than where+when, so what’s the fuss about? Free our data: you will benefit from it! Bryan Sivak, Chief Technology Officer of Washington DC (yes, they have a CTO! ), has clearly shown it with an impressive talk: freeing public data improves service level and saves public money. This is a powerful concept: if an institution releases data, developers and business will start creating enterprises and applications over it. But more importantly, the institution itself will benefit from better accessibility, data standards, and fresh policies. That’s why the OCTO has released data and facilitated competition by offering money prizes to developers: the government gets expertise and new ways of looking at data in return for technological free speech. It’s something the UK (local) government should seriously consider. Jonathan Raper, our Twitter’s @MadProf, is sure that partnerships between companies and users will become more and more popular. Companies, in his view, will let the cloud generate and manage a flow of information about their services and possibly integrate it in their reputation management strategy. I wouldn’t be too optimistic, though. Albeit it’s true that many longsighted companies have started engaging with the cloud and welcome autonomous, independently run, twitter service updates, most of them will try to dismiss any reference to bad service. There are also issues with data covered by licenses (see the case of FootyTweets). I don’t know why I keep thinking about trains as an example, but would you really think that, say, Thameslink would welcome the cloud twitting about constant delays on their Luton services? Not to mention the fact that NationalRail forced a developer to stop offering a free iPhone application with train schedules – to start selling their own, non free (yes, charging £4.99 for data you can get from their own mobile web-site for free, with the same ease of use, is indeed a stupid commercial strategy). Ain’t it beautiful, that thing? We’ve seen many fascinating visualization of free data, both real-time and not. Some of these require a lot of work to develop. But are they useful? What I wonder is not just if they carry any commercial utility, but if they can actually be useful to people, by improving their life experience. I have no doubt, for example, that itoworld‘s visualization of transport data, and especially those about Congestion Charging, are a great tool to let people understand policies and authorities make better planning. But I’m not sure that MIT SenseLab’s graphs of phone calls during the World Cup Final, despite being beautiful to see, funny to think about, and technically accurate, may bring any improvement to user experience. (Well, this may be the general difference between commercial and academic initiative – but I believe this applies more generally, in the area of data visualization). MIT Senselab‘s Carlo Ratti used gsm cell association data to approximate people density in streets. This is an interesting use of technology. Nonetheless, unorthodox uses of technologies, especially locative technologies, must be taken carefully. Think about using the same technique to calculate road traffic density: you would have to consider single and multiple occupancy vehicles, where this can have different meanings on city roads and motorways. Using technology in unusual ways is fascinating and potentially useful, but the association of the appropriate technique to the right problem must be carefully gauged. This is generally true in research, but I would say it’s getting more evident in location-based services research and commercial activities: targeting marginally interesting areas of knowledge and enterprise. Ratti’s words: “One PhD student is currently looking at the correlations between Britons and parties in Barcelona… no results yet“. Of course, this was told as a half-joke. But in many contexts, it’s still a half-truth. What a shame having missed last year’s WhereCamp. 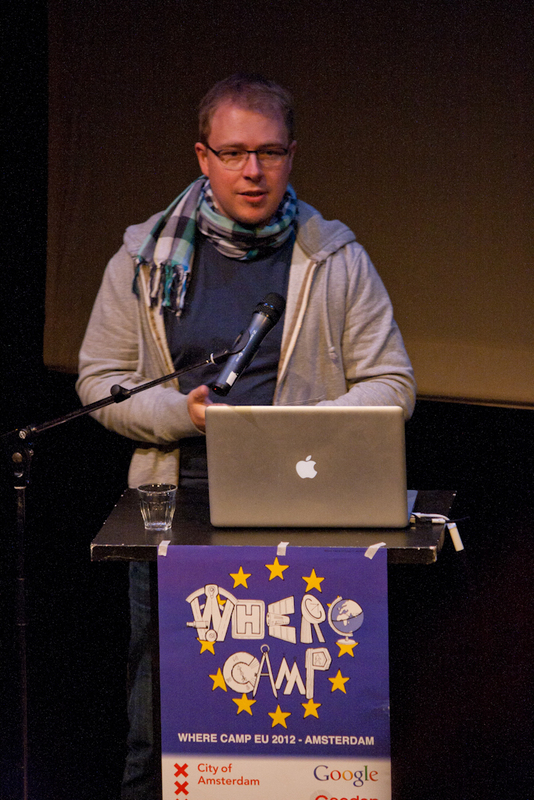 The first WhereCampEU, in London, was great and I really want to be part of such events more often. 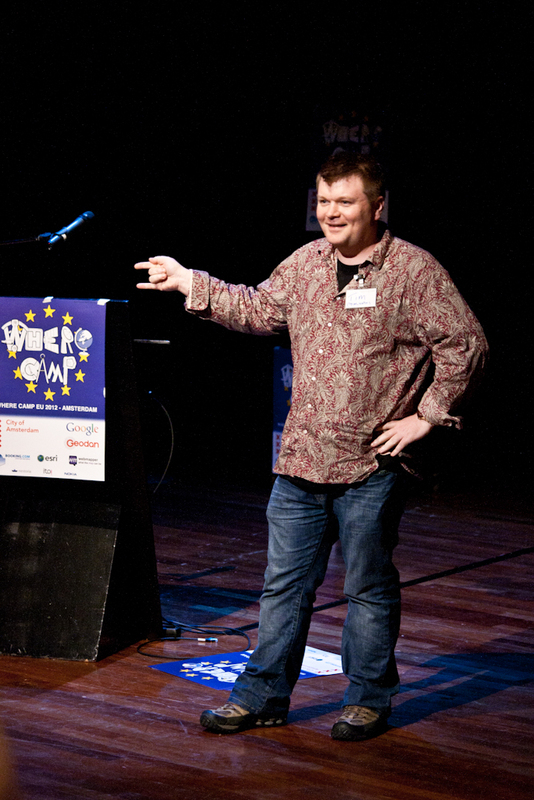 WhereCampEU is the European version of this popular unconference about all things geo. It’s a nonplace where you meet geographers, geo-developers, geo-nerds, businesses, the “evil” presence of OrdnanceSurvey (brave, brave OS guys! ), geo-services, etc. I’d just like to write a couple of lines to thank everyone involved in the organisation of this great event: Chris Osborne, Gary Gale, John Fagan, Harry wood, Andy Allan, Tim Waters, Shaun McDonald, John Mckerrel, Chaitanya Kuber. Most of them were people I had actually been following on twitter for a while or whose blog are amongst the ones I read daily, some of them I had alread met in other meetups. However, it was nice to make eye-contact again or for the first time! 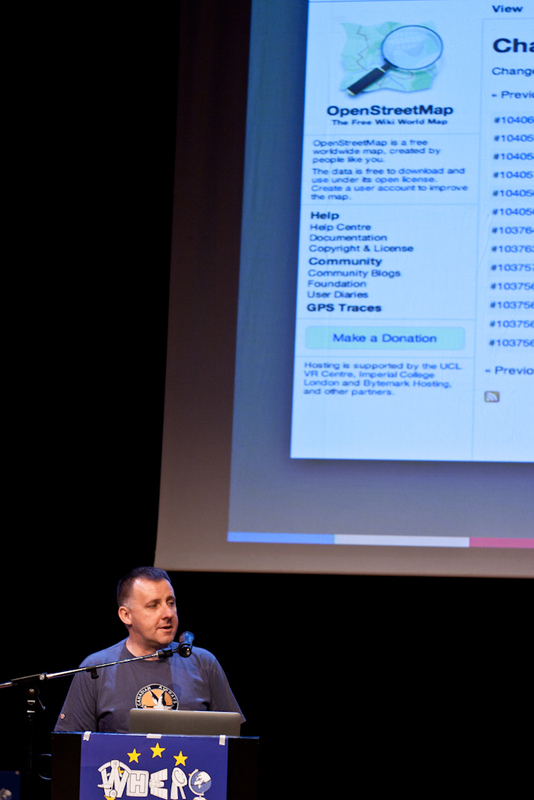 Chris Osborne‘s Data.gov.uk – Maps, data and democracy. Mr Geomob gave an interesting talk on democracy and open data. His trust in democracy and transparency is probably quintessentially British, as in Italy I wouldn’t be that sure about openness and transparency as examples of democratic involvement (e.g. the typical “everyone knows things that are not changeable even when a majority don’t like them“). The talk was indeed mind boggling especially about the impact of the heavy deployment of IT systems to facilitate public service tasks: supposed to increase the level of service and transparency of such services, they had a strong negative impact on the perceived service level (cost and time). and Location & Privacy; from OMG! to WTF?. Albeit including the word “engineering” in his job title, Gary is very good at giving talks that make his audience think and feel involved. Two great talks on the value of privacy wrt location. How much would you think your privacy is worth? 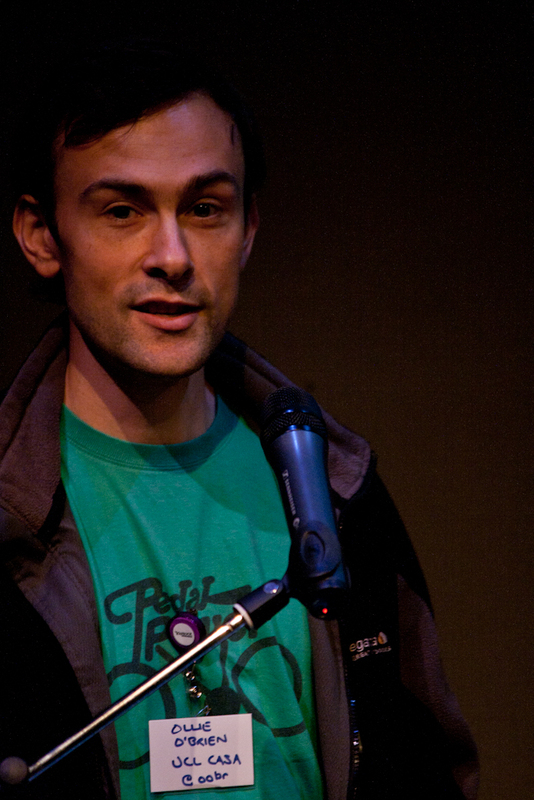 Apparently, the average person would sell all of his or her location data for £30; Gary managed to spark controversy amidst uncontroversial claims that “£30 for all your data is actually nothing” – a very funny moment (some people should rethink their sense of value, when talking about UK, or at least postpone philosophical arguments to the pub). Cyclestreet‘s Martin Lucas-Smith‘s Cyclestreets Cycle Routing: a useful service developed by two very nice and inspired guys, providing cycling route maps over OpenStreetMaps. Their strenght is that the routes are calculated using rules that mimick what cyclists do (their motto being “For cyclists, By cyclists“). Being a community service, they tried (and partially managed) to receive funding by councils. An example of an alternative – but still viable – business model. Steven Feldman‘s Without a business model we are all fcuk’d. Apart from the lovely title, whoever starts a talk saying “I love the Guardian and hate Rupert Murdoch” gains my unconditional appreciation :-) Steven gave an interesting talk on what I might define “viable business model detection techniques“. As in a “business surgery” he let some of the people in the audience (OrdnanceSurvey, cyclestreetmaps, etc…) analyze their own business and see weaknesses and strenghts. A hands-on workshop that I hope he’s going to repeat at other meetings. OpenStreetMap: a Q&A session with a talk from Simone Cortesi (that I finally managed to meet in person) showing that OSM can be a viable and profitable business model. Even stressing that they are partially funded by Google. Maybe some more involvement from big players would be interesting. Debating face to face about their strategy, especially when the geo-community is (constructively) critical on them, would benefit everyone. Nice London Geo/Mobile Developers Meetup Group meeting yesterday at City University. High level of the talks, providing vision, reporting experiences, and showing technologies and nice uses of them. Here’s a short summary. Best quote: “Tokyo is a vertical city“. That’s absolutely true, and this fact has a direct impact on geo-apps: being shops, clubs, bars, developed vertically at different levels of the buildings (this is a pic I took of the Keio Sky Garden, for example, and there are hundreds of beer gardens up on the roofs of several skyscrapers!) there’s a real need for accurate altitude information and 3d-mapping, or at least altitude-enabled maps. The interesting question for me here is how we can show multi-floor information on the 2d-maps currently in use. An artists’ collective perspective on geo-development. Absolutely intriguing, as not the average techietalk you would expect from a GeoMob. I found this personally interesting, as I played with the Can you see me know? game and even created a modified version of it at the UbiComp Spring School at Mixed Reality Lab, University of Nottingham in April 2009, during a workshop dealing with Locative Game Authoring. They introduced their concept of a web 2.0 site for creating a personal atlas. Basically it’s about putting photographs and commercial activities of interest on a personal map. They seem to be developing APIs and the possibility of creating widgets, and directly deal with small companies (hotels, b&b, restaurants, bars) to put them in their database. The idea here is that users will be allowed to tell the (possibly intelligent) system what categories of data they’re mostly interested in, leading to some kind of customised Michelin guide. My favourite talk of the night. Laurence has been longing for a way of placing precisely photographs on a map for more than 10 years. I was astonished of seeing him doing many of the things I would have liked to see in web sites like Flickr and that I’ve been discussing for ages with my friends and colleagues! Using gps data, a compass, waypoints, directions, focal length, and all the other data associated with a photograph, Laurence is developing a web site to allow users navigate those pictures, even creating 3d views of them like the guys at University of Washington with Rome wasn’t built in a day. Funnily, he started all of these before gps/compass-enabled devices were available, writing down all of his data on a notebook, and he even had problems with the police inquiring why he was taking picture at the Parliament (unfortunately, I have to say he’s not alone -_-). Mikel explained what OpenStreetMap did to help in Haiti. Disaster response relies heavily on updated maps of building, streets, and resources, and OSM quickly managed to get that done. A great thanks to him and to all of OSM guys to show the world that mapping can be helpful to people even leaving out profit considerations.